In my second grade classroom, I’ve recently identified a troubling gap in my students’ learning… Counting. I know how important counting is… and we have been counting all year. We count while we wait in line, we count backwards and forwards, by 2s, 3s, 5s, 10s and more. 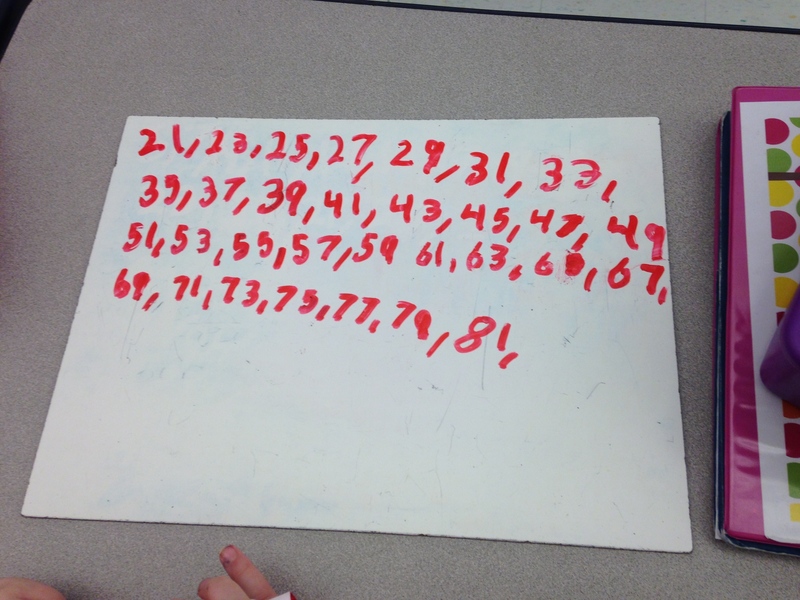 We start in the hundreds, we start in the teens… So, why (I’ve asked myself and anyone who will listen) am I observing students struggle to cross decades when counting in the midst of double digit addition and subtraction?!?! Here’s what I mean: We are working on adding multidigit numbers and I stumble upon a student who is heading toward the wrong answer. As I listen to her explain her thinking, I realize when she counts from 19 to 20, there is a question mark in her voice and she looks up at me for reassurance. From 38, 39 she heads to 60 with the same inflection and eye contact. The scariest part… she’s not the only one. I’ve realized this is a symptom of a few more serious issues, one of which is patterning in base ten… and conceptualizing the magnitude and difference of numbers. So what are we doing about it? After consulting with some of my favorite math teachers… here’s the plan. First, I’ve been doing an activity we call Sound of a Number for a few minutes each day.The kids love it and they are exercising an important part of their math brain. For this activity, I hide behind a cardboard study carrel with a pile of base ten blocks. Students listen hard to attempt to identify the value of the blocks I drop. We start each lesson with a quick review. I drop of each of the pieces, unit, ten rod and hundred flat; a student identifies each by sound and explains some of the different ways each could be made. For example, we could make a hundred flat with ten ten rods or 100 unit cubes etc. This helps to deepen the concept of base ten. Next, I drop different quantities and students listen intently to try to name it. This feels like a game and I learn a lot about students’ thinking. For example, when I dropped 21 (two ten rods and one unit cube), a wrong answer of 23 or 25 was different than 201. Most answers are accurate though, during this quick activity. What else seems to be helping? Here’s a center I threw together that my students are loving! Other bonuses… it practically differentiates itself and gives me great information about my students’ thinking. These center directions got kids started. This student rolled a 1 and a 2 and decided to start at 21. At the center, students had three dice, white boards, markers and socks (for erasing). Students could decide on their own if they wanted to roll two dice to get a 2-digit starting number, or three dice to get a 3-digit starting number. I was impressed with the choices students made for themselves. These card games have also helped us deepen our understanding of base ten!